Haven’t found the perfect centrepiece yet for your wedding? Today, I will share one option with you that won’t blow your budget but is extremely personalised. Think about how many lanterns you will need and what size you would like. You will need 3 frames per lantern. Buy the frames in the colour you like, you can get them at cheap as chips. Choose your favourite pictures of you and your partner from your travels, adventures, family/friend gatherings or your childhood and print them on vellum paper. Make sure to print the right size for the frames you bought. If you have a photo printer at home you could print them yourselves otherwise I recommend office works since with a normal printer the ink won’t dry on vellum paper. Remove the back of the frames and clean the glass thoroughly from front and back. Be careful, any dust will be seen once you put a candle behind the picture. Stick the vellum paper with sticky tape onto the frame from the inside. Vellum paper has a front and back side so make sure to stick it so the front of the paper is what people will see. By sticky taping the paper onto the frame the glass will also stay in the frame. Glue 3 frames together to form a triangle shaped lantern. You might want to sticky tape them together so you don’t have to hold them while applying the glue. The sticky tape can be removed afterwards. Remove any residual glue and let it dry. Put each lantern on a mirror base, put the electric candles inside the lantern, scatter some decorative sand, flowers or stones around the lanterns and a few real tea lights. 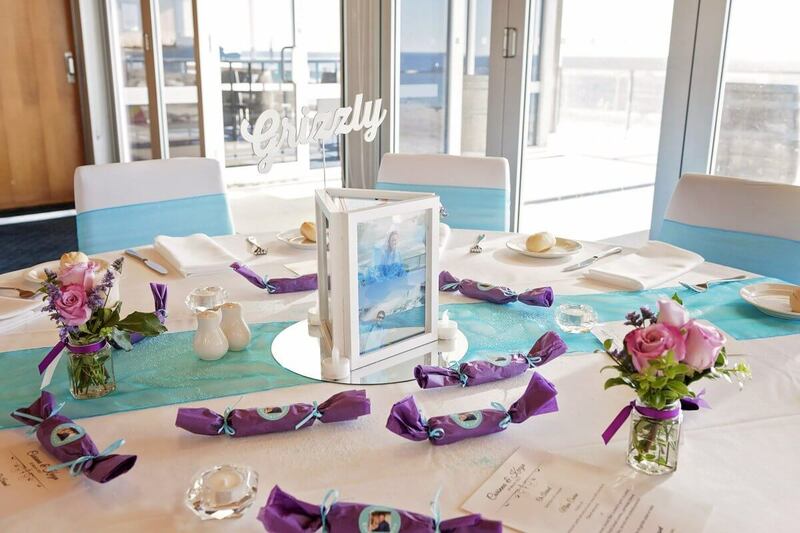 Your personalised wedding centrepieces are complete! After the wedding, you can keep a few lanterns to decorate your home or pull the frames apart and just hang the pictures on the wall! This entry was posted in Weddings and tagged budgetwedding, DIYcentrepieces, DIYweddings, weddingdeco, weddingideas.